First let me clarify the title of this editorial that states "not all art is licensable." I actually believe that it is possible for artists to license ANY art style and ANY theme. However, if the theme and art style does not appeal to the mass market,* artists may be very limited in number of manufacturers that will license it. Manufacturers are looking for art to enhance their products so consumers will purchase them. Thus, the purpose of ART LICENSING IS TO SELL PRODUCTS to make money. And to make money, manufacturers need to sell their products to a lot of people. *Note: The term mass market can refer to chain stores that focus on high sales at low prices such as Walmart. However, In this editorial I am using the term mass market to refer to a large market segment of the population as opposed to small specialized niche market segments. I get many e-mails every month from artists who cannot understand why they are unable to license their art or get a licensing agent to represent them. Many have gone to art or design school and learned the techniques to create beautiful art and surface design. Some of them are successful in selling their art at street fairs, in art galleries, as illustrations for children books, or on products in print-on-demand internet websites such as Cafepress, Zazzle, and Etsy. But just because the art is beautiful and successful in these industries does not necessarily mean artists will be successful in licensing the art onto products to the mass market. This editorial discusses why artists have problems licensing their art despite it being well received in the industries mentioned above. Selling art at street fairs, art galleries, children books, and print-on-demand websites are examples of niche (pronounced "nitch" or "neesh") markets. Niche markets are aimed at satisfying certain market needs such as specific consumer demographics, specific geographic areas, specific type of products, specific type of art, etc. There are some manufacturers that specialize in licensing art for particular niche markets but the majority produce products for the mass market. Thus, their products and the art they license MUST appeal to a broad spectrum of consumers. Art licensed to the mass market is image-theme driven. Images and themes that appeal to a wide range of consumers are flowers, butterflies, cats, seashells and other coastal images, wine related images, roosters, cows and other farm images, Christmas trees, Santa, snowmen, etc. In other words, images that are seen everyday or during the holidays that evoke an emotional response (how beautiful, cute, funny, inspirational, etc.) are the most sought after art for products. Thus, art themes that are not in vogue or does not have central images that evoke an emotional response is unlikely to be licensed by most manufacturers. For instance, abstract art can be interesting and the colors beautiful but generally products with abstract designs does not appeal to a wide range of consumers. Thus, manufacturers putting abstract art on their products sell to a niche market such as the fabric and clothing industry. Likewise, a serene lake with snow-capped mountains in the background that is beautifully painted would have limited licensing potential; possibly a print or jigsaw puzzle manufacturer but few others. However, by painting a dock on the lake and possibly a person fishing off it in the foreground with only a hint of the mountains in the background appeals to more consumers and enhances the possibly of licensing the art. Niche markets are usually aimed at selling products to consumers interested in specific themes such as southwest and northwest Indian art, and western art. Even the art of famous fine art masters such as Monét, van Gogh, and Rembrandt is a niche market. 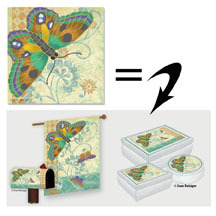 Products with their art is sold mainly as art prints and in museum gift stores. Contemporary art sold at street fairs probably will have themes that are popular with local customers such as cows and roosters if located in a farming area, or grapes and vineyards if located in wine country. At the present, those themes just so happen to be popular for the mass market and thus could be licensed. However, also sold at street fairs may be paintings of local historical buildings or unusual animal breeds that are raised locally (i.e. llama). Those themes may be popular locally but will most likely not have a great enough appeal to the mass market to entice a manufacturer to license them. Likewise, local landmark art displayed in galleries in popular tourist cities such as San Francisco and lodge art near Yellowstone National Park may be popular in those venues but not as prevalent elsewhere. Generally, art galleries are a niche market because they cater to customers who wish to purchase original paintings and can afford to do so. Gallery customers tend to seek specific artists, art themes, and styles of art that is not popular to the mass market. Often, the art in children books are illustrations of children or animals doing some activity. Even if the illustrations are excellently rendered, they may not be licensable because individual illustrations supporting actions in a story most likely will not appeal to the mass market. For example, showing a dog running down the street or sitting in the bed of a pickup truck are not images a consumer will buy because they do not emote an emotional response without the story line. However, an image such as a cute little puppy tugging a long suffering older dog's ear appeals to consumers and could be licensed. Thus, book illustrators may or may not have the art suitable for licensing. However, some of the illustrations already created for books mostly likely could be adapted for licensing if the artist is willing to rework them. Print-on-demand internet stores are ideal for consumers that want unique, specific themes, and personalized products. Some artists that paint specific themes not available in the mass market find this venue a viable way to sell their art. For instance, artists that paint a variety of dog breeds do well selling products with their art via internet stores but have a difficult time finding manufacturers willing to license them. The reason is that dog lovers are breed specific and are interested in only purchasing products with art of a particulate breed. 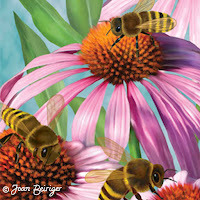 Many artists offer all sorts of products on these websites with single icons (flowers, animals, geometric shapes, etc.) that can be personalized. This type of art may work well for a print-on-demand e-stores but is not normally wanted by manufacturers selling to the mass market. Of course, if you already have licensing deals and continue to get them, then you know that your art is licensable. If you are new to licensing and not yet been able to get contracts or find an agent to represent you, perhaps you are not painting themes that appeal to the mass market or not unique enough or your portfolio lacks diversity of themes. One way to find out is to get as many opinions as possible about your art from persons that are knowledgeable about art licensing and that are willing to give you a honest opinion. These could be artists that have licensed their art, licensing agents, licensing consultants,** and manufacturers. If you are serious in wanting to license your art DO NOT take the comments personally and negatively. Turn the knowledge you learn into positive ways to evolve your work so that you can license it. Read "Don't give up Your Dreams and Grow a Thick Skin - Part 1." ** Read the article "On Art Licensing Coaches (consultants)." Artists and agents recommend that you should paint the subjects that you love but if you are serious about licensing you may have to do some compromising. For example, if all you paint is realistic looking elephants and elephant themed art is not the trend you can wait until the trend comes around (it is bound to sooner or later) or add popular themes to your portfolio. Artists that are successful in licensing their art is constantly evolving their art. Read the following articles about evolving art by agent Suzanne Cruise: "How to Keep Art Fresh & New: Continually Evolve Your Work - Part 1" and "How to Keep Art & New: Reworking Old Art for Today's Greeting Card Market." Look at the websites of the following artists that have successfully licensed their art. I purposely chose artists with different art styles to show that all kinds are licensable. Notice the kinds and variety of themes that they create. The information in this editorial is my opinion and NOT gospel. Get information from as many people as possible and use what works best for you! Make sure that you read the comments to this editorial. Not everyone agrees with my opinions which is the reason why you need to get information from multiple people so that you can make informative decisions about your art career in licensing! Comments are welcome. Please click on comments and write them in the comment window at the bottom. Thanks for posting this article, Joan. I really enjoyed reading it and learning from you. Joan if you are so good at knowing what art is licenseable or not, care to share how many licensing contracts you have? How many skus does one need in a gift showroom to be successful? what a sad editorial this is. Artwork created solely for the mass market is often so generic that it has no soul. It's blah. and that is just my opinion. Shared by many. I'm really glad that artists like Patience Brewster, whose work is not generic didn't get this advice when she was starting out - she may have never pushed forward. I think that putting work out which has soul is the first key to success. People will respond to it, become followers and fans and then become lifelong consumers or collectors. Those who put out art that is generic will get deals too but they aren't building their brand - just littering the world with more generic stuff. As Patience Brewster's agent in the beginning, I am a huge fan and am so happy for her success. Patience has created characters that are endearing and unique and paired them with clever names and editorial that speaks to the heart. Her work creates an emotional response -mostly laughter! Patience (and her team of mostly family) have made very careful decisions about their partners in order to preserve the quality and uniqueness of her brand. In fact, I believe she has taken most everything in house at this point so she can control the quality and the distribution. This is not the normal path of a licensed artist! Your article is composed of so many valid truths, especially to those of us that license our art. Thank you for sharing. It would be nice if "Anonymous" would provide their name and expertise in this field and share with us as to how they have come to these conclusions about art work that is licensed. Having been in the biz as a licensing agent since 1990, I can WELL assure you I have seen a great deal of art sent to me from people who sincerely thought their portfolios were very licensable, but in reality, that was the last thing that would ever happen with them. I've seen my fair share of really darn good art, but art that was totally not suited for the art licensing arena (but it may have been very well suited to other art venues). This is the EXACT point you totally missed that Joan was making. I have seen much great and not so great art that had a ton of soul put into it, but soul didn't mean it was going to appeal to any segment of art licensing. The bigger picture about putting soul in your art is that whether the art is for licensing, or commercial art, or book illustration or whatever, soul will give it at least a bit of a leg up in that industry. Joan clearly states that artists should "get as many opinions as possible from people who are in art licensing" in order to better know if your work fits there or somewhere else. Wise advise indeed. Licensing for art is driven by trends. I think right now companies are being very cautious and are going with what they see as safe choices. This may change with the changes in the economy. From a business standpoint it's important to pay attention to that. If this is what companies want than you want to produce art to meet their needs. I agree with Joan that you do need to think of this as a commercial market. It doesn't mean that you can't create images for other markets. I work on images for books, fine arts and licensing. Some images can cross over but others just don't fit the markets needs. I think you have to look at things from a business stand point. There may be companies that do things that aren't for mass market. The thing you need to think about is targeting to a market. I think they are two areas of art licensing. There is a larger more generic area where the artist is trying to get artwork into various formats (repeat patterns, square shapes, circular shapes, etc.) so that it can possibly fit on as many products as possible. And then there is the more focused area. i don't think niche is the right word though. It's more brandable as it is artist driven by the name and look of the artwork. Think Thomas Kinkade, Jim Shore, Mary Engelbreit, Kelly Rae Roberts, Cheri Blum. You immediately recognize it when you see it. I think there is room for both within the art licensing industry. To say that "this artwork is too narrow in focus for mass market appeal to be licensed" seems wrong to me. Joan, your intent with this editorial may have been to be helpful to people looking to break into the art licensing arena by helping them understand different aspects of the industry. And maybe it does from all the comments. Perhaps I am reading it wrong. I just hope that people take everything they read with a grain of salt and do what feels right for them with their art career path. Excellent point on being a "brand" versus generic licensing. You've given me something to think about and when other's have asked me about my designs, and how the love the story that comes with my designs I will focus on my brand from here on out. One of my favorite brands on the market would be P. Buckley Moss. If you get a chance watch the PBS documentary about her life, and watch it carefully, because it is there that you will discover that she has her "commerical brand" and also to other bodies/styles of work that the average consumer does NOT know about. Those works are sold off of her easel before they are even completed and those works are very different than her "commercial brand". So for the artist that wants to have a commercial brand, or generic licensining, AND still produce works that make that other part of your soul sing, don't give up it IS possible! Also great points Mr. Mathis. Joan wrote...."Artists and agents recommend that you should paint the subjects that you love but if you are serious about licensing you may have to do some compromising." It seems as though every industry is built on negotiation and compromise at some level. I can't imagine that art licensing would be any different. From a newbies point of view, this article was extremely helpful and thought provoking and the comments were just as intriguing. Examining both sides of the coin usually results in a broader perspective on any topic. I spend time working on a portfolio everyday for the art licensing industry. Will any of the artwork be accepted for a licensing contract? I don't know. In the meantime, I'm grateful for the articles and conversations provided by all of you. Joan, thanks for the good article. There are valid points being made here, but I think you need to view this information in terms of the business of art licensing – while there may be the occasional niche application for “unsuitable” art, you are not likely to make a living at it. I also do not agree that Patience, Jim Shore, Kelly Rae and some others mentioned are not mainstream art – they may have a unique twist or recognizable look, something that can be very desirable, but they are hardly operating on the periphery of the business. I will second Suzanne’s comments about the majority of the art that agents receive – I’ll say over 90% is just not licensable. Subject and style are certainly issues, but most often it is just not good enough. The above mentioned artists, and I dare say any successful licensed artist, have learned their trade and are accomplished in their craft. If there is any disservice being done by this current “rush to licensing”, it is the message that if you just believe in your art you will succeed. Nice platitude but just not the case in this business. Not the aggressive "Anonymous" here. Just don't have an online presence at this time. I started licensing my art in the late 80’s, before there was internet and very few even knew what art licensing was. I really could have used your help back then, thank you for the guidance you provide for the newbies of today (too bad some don’t appreciate it!). For a while I was very successful in art licensing (by my standards, I made a good living). However, I made the mistake of trying to please too many art directors and letting myself be pulled in too many directions. By the time I figured out the idea of creating my own "brand" and sticking too it I was pretty much "burned out". Art Licensing is a commercial business; there is no shame in that. Unfortunately some artists believe you should only do art for art sake (I even had an art teacher tell us not to "prostitute" ourselves if you can believe that!). That’s fine if you are either independently wealthy or you don't mind waiting tables on the side... I guess every artist has to decide if their art is a career or a hobby. Over all I enjoyed "playing the game" and someday I will start painting again (it's been a long time). When I do, I plan to throw my hat back into the ring. So, as you always advise your readers, watch the markets and the trends and find a way to express what you see in a way that is truly your own. To the "Aggressive Anonymous", enjoy your hobby! Good luck and good art to us all! I wanted to thank you for this great article. I love the insight that you've shared and agree with you on nearly every point that you've made. What some fail to see, my husband included until recently - (he is the artist I am the business side of things) is how important it is to create for mass market appeal if you want to be successful in licensing. I think there are two ways you can look at this, one perspective is that you're "selling out". Artists hear this from the galleries, from their "niche" fans, etc. The other perspective is if I produce enough artwork for mass market licensing, and it is bringing in a nice PASSIVE income, then that affords me the time and freedom to create the art that I am more passionate about. My husband is now building a larger library of more generic images. He is passionate about the ocean, waves to be exact, and surfing. I've been begging him for years to "not paint the surfer", then it's beach/coastal art, not "surf art". A very simple compromise creates a piece of art that is much more suited to mass market. I think every artist has to make that personal decision. It's not been easy for my husband, but now he wishes he'd seen the light sooner. People can call him a sell-out if they want, but he's smiling as the royalty checks and the new licensing opportunities roll in. We've got a ways to go to "living our dream life" but we feel certain we're on the right path! Good luck to all of you, and whatever choices you make in your art business, may you have massive success! Thank you Joan, I've listened to this audio before and it was very encouraging as well as educational! Excellent article, Joan, and quite to the point. I couldn't agree more with Suzanne Cruise's rejoined to "Anonymous". I've received many hundreds of art submissions from artists who felt their art was so very good that it was perfect for licensing, but they hadn't taken the time to study what licensing is all about, or even visit a mall or a large national chain to look at products with licensed art and get a feel for the market. They're too wrapped up, in many cases, in how wonderful their art is. And while it may indeed be wonderful, beautiful, lovely, or charming, as for its suitability for commercial art licensing, forget it! Over the years I've learned to avoid artists who paint only for themselves and not for the end buyer, that consumer who is generally a woman aged 30 or above, who purchases the vast majority of retail goods in America. She purchases for her spouse, her children, her home and herself (the guys buy the toys). She's the heart of the market and every manufacturer of giftware, home and quilting fabrics, kitchen fabrics and kitchen accessories, home decor products, stationery and crafts knows her well and tries to create products that she'll like. So if an artist wants to be successful in licensing his or her art, the answer is to paint for the market and for the end consumer, not for one's self. There are plenty of barns with paintings stored inside because they never sold and never licensed. While they might be discovered someday, they're not likely to figure well in the creation of a viable career in art licensing. the reason those paintings are sitting in barns is because they didn't possess a compelling enough story that the consumer would want to purchase them. I see this all the time as a fine artist, I see other artists creating art for the sake of creating art, which results in zero sales... and then the artist mopes off telling themselves that maybe it's not right to ask for $$$ for their art since no one is interested, which perpetuates another myth that if you are selling your artwork you are prostituting yourself. Given the current economy if the product doesn't have a compelling enough story then the consumer isn't interested. Very nice post Joan. Even amongst the art themes and ideas the aggressive Anonymous considers generic, their's a wonderful and dynamic amount of diversity. Each artist putting their spin and love into their work and it shows. Thanks for encouraging thoughtful discussions! The "selling out" argument is a lame one. An artist can do both--design for themselves and the market. Some pieces you do for yourself, some for the market, and you'd be surprised how, with time, they start to overlap. Sounds like Anonymous has had a heaping helping of sour grapes, and also doesn't know what he/she is talking about.